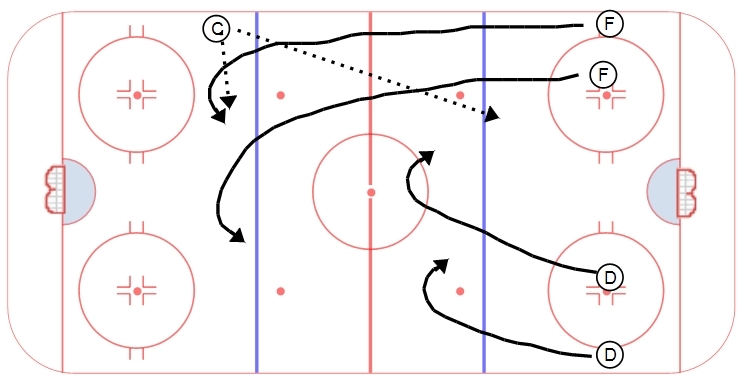 Another transition drill, this one focuses on the offensive side of the transition game. The drill starts with X1 and X2 (in black) crossing and attacking one D 2v1. Play out the rush. On a whistle, X3 takes off with a puck. X1 and X2, as well as the D that played the 2v1 join him to create a 4 man rush. 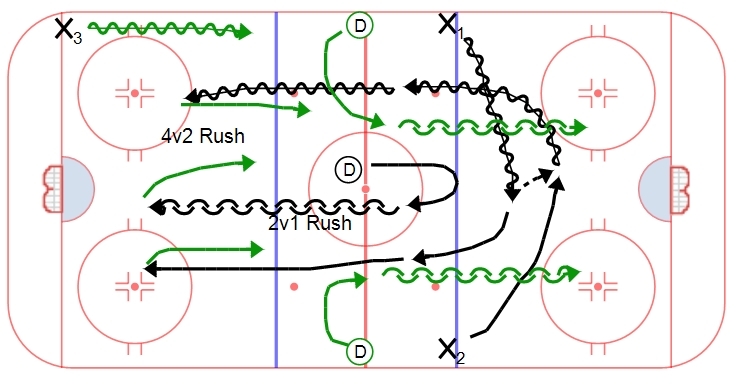 Two new D (in green) gap from the red line and play the rush 4v2. This rush plays out. On the whistle, two new players cross and attack 2v1. 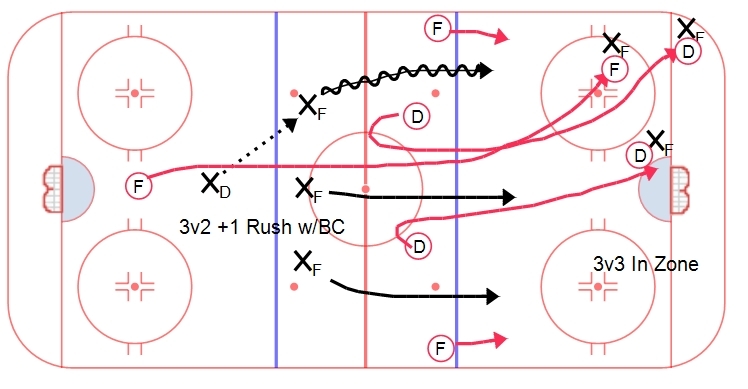 X3 provides backpressure on the 2v1 rush. The drill becomes continuous. Areas of emphasis are quick transition from the 2v1 to 4v2. On the whistle, every player should be looking to quickly jump and attack on the change of direction. The D should activate quickly and look to get up ice to create a four man front. A multi-faceted drill this week: Devils 2v2 Net Front/Regroup. This rill starts with a pass from down low to the strong side D. D-D pass then a shot or a pass to the high roll F for a shot. Two D step out from next to the net and defend the net front against the high roll F and a second F who battles for a screen. After the shot, a second puck is placed in the neutral zone by a coach. The offensive D retrieve it and regroup with the forwards, while the two net front D gap up and play a 2v2 rush. The drill runs out of opposite ends in an alternating sequence. 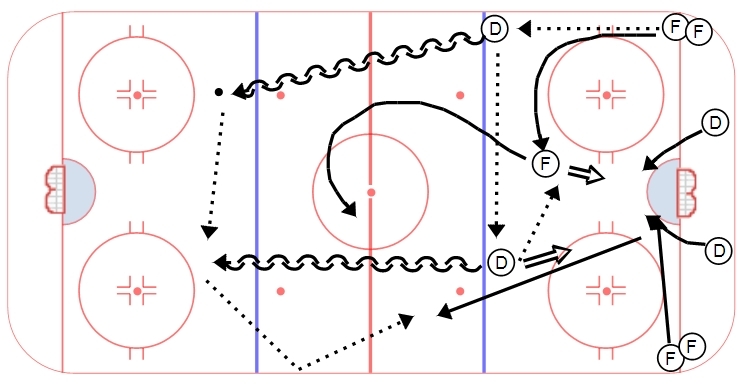 This drill works a number of concepts, including offensive zone play with your D, net front battles between D and F, a neutral zone quick counter and 2v2 rush play by the forwards and the D. Due to the number of D involved in the play, you need to have 8 defensemen in order to run this drill. The D always play out of the same end, rotating from offense to defense.